That the line works on both levels—as a lacerating satire of inappropriate intimacies; as a riff on the season’s unsettled complexion—is much of Search Party’s charm, which it carries into Season Two through a scintillating evolution from mystery to horror. From a neon sign that reads “slay” and an eerie synth jingle to a painting of a dead man and a play about Charles Manson, it’s littered with half-frightful, half-funny details; the episode titles (“Murder!” “Suspicion” “Obsession,” etc.) might’ve been culled from the poster for one of Hitchcock’s classics. Indeed, if the first season’s search for Chantal Witherbottom (Clare McNulty) once reminded me of Vertigo, the second completes the connection: Dory and co. are the series’ Scottie Fergusons, unraveled not by the chase, but the capture. In the Season One finale, which itself presages the change of genre, Dory learns that Chantal disappeared herself, for utterly anodyne reasons—and only after her boyfriend, Drew (John Reynolds), bludgeons to death a private investigator hoping to claim Chantal’s family’s reward. 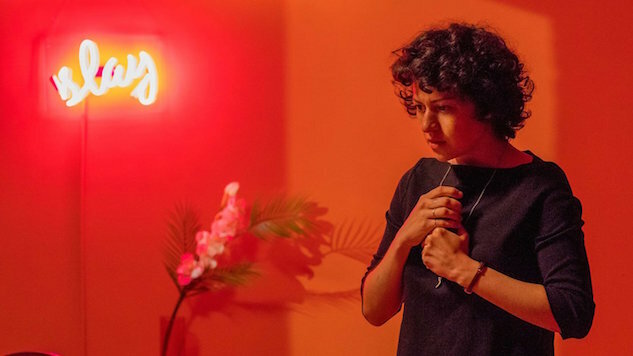 As in the first season, Search Party retains a frank understanding of men’s menace, particularly as it wonders whether the characters have been party to a murder, or simply acted in self-defense: “He was attacking me,” Dory ventures uncertainly in Sunday’s premiere. “Or maybe he was just talking to me.” (“I killed a man, and he didn’t deserve it,” she later confesses to her drunk, drugged, and/or half-asleep employer, Gail, played by Christine Taylor. “Oh,” she mumbles in response. “I’m sure he did.”) For the most part, though, the second season channels the terror inward, then amplifies it; its subject isn’t guilt but repulsion, watching as the main quartet attempts to cover up their crime and recoils at the consequences. If this sounds serious, it is—Search Party no more downplays its relationship to horror than it did the foreboding that accompanied Chantal’s disappearance, which is exactly why its witches’ brew of genre influences is so delightfully heady. But it’s not only that; if Dory embodies the series’ sincere interest in the wages of sin, Elliott’s own descent into madness becomes the source of a comic miracle. As the oily, self-obsessed pathological liar—he’s writing a book about pretending to have had cancer—John Early is so relentlessly funny that he practically shoplifts the season from his cast mates; with the flutter of his hands as they come up to his temples, or a note-perfect line reading (“I guess that’s, like, a felony, or whatever”), he sends up a very particular brand of privileged white gay without reducing the portrait to caricature, and seeing Elliott come unglued may be the season’s foremost pleasure. It’s also—and this is at the core of Search Party’s brilliant sophomore effort—inextricable from the season’s underlying horror, which is that of getting what you asked for. As Portia (the terrific Meredith Hagner) submits an acquaintance to cruelties to win a part in that Manson play (“You guys, they’re my all-time favorite murders!”) or Elliott flails under his editor’s pressure; as Drew pursues a promotion and Dory continues to search for herself, it turns out that finding Chantal, like finding success, is not a solution, but rather a new set of problems. Though I want to put on my Stefon voice and say, this show has everything—a Marge Gunderson figure on the characters’ trail; a guest arc for J. Smith-Cameron; scatalogical humor, awful pseudonyms, primal screams—the fact is, that everything is working in felicitous harmony to underscore Search Party’s most elemental fear: Seeking, and ultimately locating, the thing we thought would make us happy, only to discover that it’s not what we thought it would be. “You did it, Dory,” Drew says on this point, in withering deadpan, when they return to the States. “You saved Chantal.” He needn’t ask the season’s scariest question, because it’s implied at every stage of its millennial horror story: What’s next? Season Two of Search Party premieres Sunday, Nov. 19 at 10 p.m. on TBS. Listen to our conversation with series creators Sarah-Violet Bliss and Charles Rogers here.